There’s nothing I hate more than tennis. More specifically, watching tennis on TV. So imagine my dismay my sophomore year of college at WPI when my roommates were obsessed with watching Wimbledon. Or the U.S. Open. Or one of those queer tournaments where the guys in little white shorts slap a ball back and forth over a net. The KISS Army (feat. the ex-Mr. Lisa Bonet) says, "We want YOU...to abolish tennis!" They would take over the TV and watch it all day long. Rather than stab my eyes out with a fork, I decided to try to make the most of it. 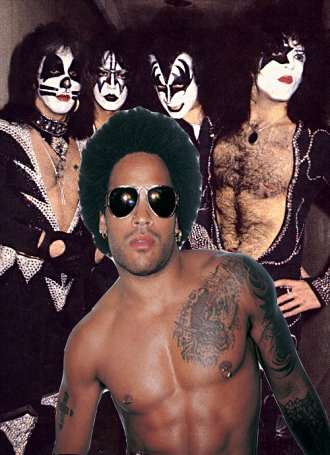 Lenny Kravitz had just released his cover of KISS‘ song Deuce, so it had been getting a lot of airplay back then. I know nothing of the rules of tennis, but I know every now and then something would happen with the score and the commentators would announce a deuce. So whenever that happened, I belted out my Lenny Kravitz impression, singing, “You know your man is workin’ hard…he’s worth a deuce!” I did this to be funny the first couple times, but then I did it mainly to annoy them into never wanting to watch tennis on TV with me in the room ever again. It didn’t work, as they would still watch it whenever there was a big event. Previous Post Do you know your enemy?